Microchip has up to 40% off a dozen development boards, with the best prices of the year going until Jan 3, 2014 when purchased at MicrochipDirect. Use coupon code EOY2013 to see the discounted price in your cart. Texas Instruments is discounting the original BeagleBone white 50% (order BeagleBN), along with three other AM335x development boards at 20% off. At $143, the AM3359 Industrial Communications Engine (order TMDSICE3359) includes two GbE ports that can be controlled from the Programmable Real-Time Unit (PRU) or from a Gbe switch. These prices will last until December 31, 2013 at the TI eStore. $10000 cash and development tools will be awarded for best applications using the ST Microelectronics STM32F429 ARM core in the EvoPrimer development platform. The application must use the Chrome-ART Accelerator graphics technology shown in the video below. You may add your own custom hardware to the platform if you send it and all the design files with your entry. For more information on the contest and the EvoPrimer platform go to www.stm32circle.com. The total cost for the base platform and STM32F429 target board is a little over $100 and can be purchased from STMicroelectronics or online distributors. The contest ends on February 15, 2014. The grand prize is $5000, and all prize winners will receive Raisonance development tools with no code size limitations and EvoPrimer platforms. The Are You an AVR Hero? Contest kicked off at Maker Faire a few weeks ago. Maker Faire is over, but you can still enter you design until December 31, 2013. This is a Facebook contest and half of the judging criteria is public votes, so you want to enter early. The other criteria are quality of the idea, quality of the device design, and commercial potential. Here is a link to the official rules. Click here to vote on a design and click here to enter. At the time of writing, the design with the most votes (83) is an LED Matrix Tic-tac-toe game using an AVR ATtiny85 on a solderless breadboard. The Arduino TRE Board is coming soon, an official Arduino open source prototyping platform. Announced today on the TI E2E community site as the most powerful Arduino available to date. It features the Texas Instruments Sitara AM3359 ARM Cortex-A8 processor. This is the same processor used on TI's BeagleBone Black. It is clocked at 1GHz, and the board also has 512MB 800MHz DDR3, HDMI, 4-ports of USB, audio I/O, XBee RF module Connectors and lots of I/O. For Arduino shield compatibility, it has the shield connectors and also an Atmel ATmega32u4. This board will also run embedded Linux. It is targeted to prototyping 3D printers, networking hubs for building control, lighting and telemetry, and DIY projects that require more processing power. EEWeb has released the first issue of a new monthly magazine targeting the embedded space. EEWeb Embedded Developer can be read online or downloaded in pdf format. The premiere issue covers NXP MCU ecosystem, a Rasperry PI primer (part 1), the Wandboard from Mouser, ARM CORTEX-A9, interviews and a 32-BIT MCU comparison. 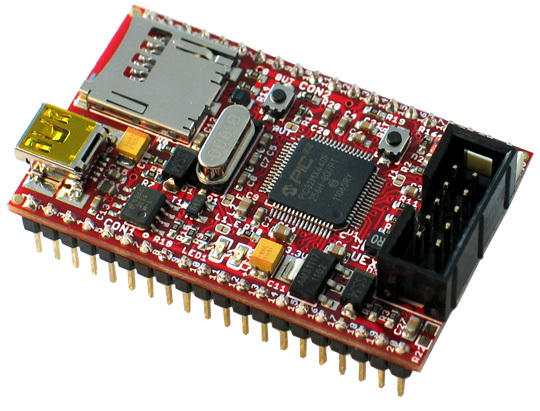 There are also short reviews of the BeagleBoard-xM, TI's Tiva C series Evaluation kit (ARM Cortex-M4F-based MCU), and the LPC812-LPCXpresso Board. EEWeb has dedicated an issue of the EEWeb Pulse to the Raspberry Pi. See Pulse Issue 106, July 9th, 2013 (The cover currently shows the wrong year, 2012). It features an interview with founder Eben Upton and pi projects. The $14 STM32F4 Discovery kit with ARM Cortex-M4 Processor can be expanded with three new boards. There is a baseboard that provides Ethernet, Micro SD, plus more I/O ($40), an LCD board with touchscreen ($55), and a camera module for video or photos ($34). See element14 for more information on the Discovery series boards. Microsemi's SmartFusion2 Starter Kit includes a small ARM SoC FPGA module and a baseboard for user interfaces and expansion. The kit is $299 but if you attend an Avnet Electronics Marketing Microsemi SpeedWay Design Workshop ($99) you receive a kit at no additional cost. The SmartFusion2 SoC integrates a 166 MHz ARM Cortex-M3, accellerators for DSP, security and communication interfaces on a single chip. The Microsemi press release for the starter kit has a nice summary of features for the development board and the SoC itself. In my search for a small, powerful, and inexpensive data logger I came across a few interesting development boards. This Maple-like board features a Microchip PIC32MX440F256H 80 Mhz microcontroller and a 16-channel 10bit ADC (only 11 channels are available on this board). It can sample at 1MSPS and can perform conversions in sleep and idle modes. The price is very reasonable too at 12.95 EUR (<$18USD). The UEXT connector allows you to add Olimex modules for a wide variety of peripherals and interfaces. Modules are available for interface, adapters, sensors, LCD, IO, video, RF. RFID, Ethernet, time, GPS, MP3 and Biofeedback. FEZ Domino was on this list because of the price and small size but it has now been discontinued. ADI part number EVAL-ADXL345Z-DB ($59.00) This datalogger isn't as powerful with only a 40+MHz ARM7-based ADuC7024 MCU, but has a lot of features. The MCU itself has a multichannel, 12bit, 1 MSPS ADC, voltage reference, temperature sensor, voltage comparator, up to 4 DACs, power supply monitor, PLA and 3-phase 16bit PWM generator. The board can be powered by two AAA batteries, and includes a 3-axis accelerometer, the ADXL345. The development environment for the sample code requires a evaluation version of the compiler, but there are GNU tools available for the processor. 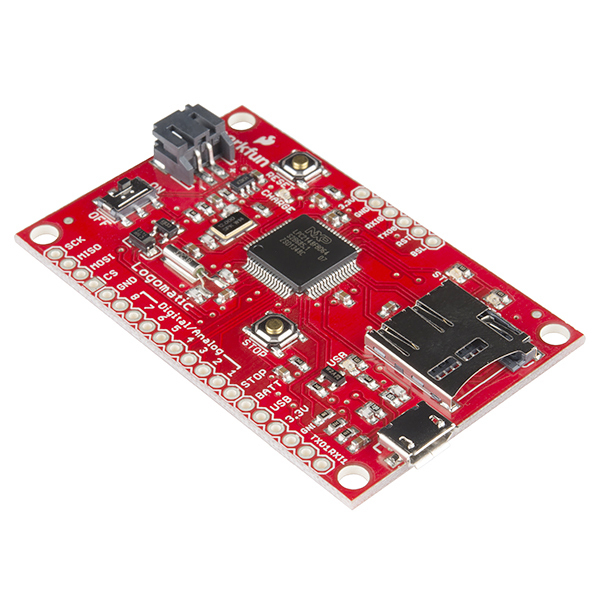 One of sparkfun's more popular products, the Logomatic V2 has a simple design and fewer features than the rest and is a little more expensive ($59.95). It uses the 60MHz NXP LPC2148 ARM7 and you can find a lot of open source code examples on the net. The board comes with the main logging firmware on Github, and SparkFun's USB bootloader, you can modify the source of either project using free WinARM GNU tools. Jean-Sebastien Stozel developed a few projects to extend the firmware including a generic C++ multitasking framework using FreeRTOS. Enter an original BoosterPack plug-in board to win prizes including a trip to DESIGN West 2013 in the 2013 Texas Instruments MCU BoosterPack Design Challenge. The Build Your Own BoosterPack program supports Texas Intsruments LaunchPad evaluation platforms. TI also encourages you to have your design manufactured and distributed by manufacturers like Seeed Studio. Finished BoosterPacks can be added to the BoosterPack wiki list where it can be promoted to the official www.ti.com/boosterpack page. Commercial products using 32-bit RX and 16-bit RL78 MCUs can qualify for a free Micruim RTOS license until March 31, 2013. This can be uC/OS-II or uC/OS-III and middleware (TCP/IP, USB, File System), plus uC/GUI. The promotion is called 'The Power of 2' and is available in the Americas. See the video below for more information, it also mentions how NASA uses uC/OS-II on the Mars Rover. The Micruim website just completed a major update, they now have free PDF books and example projects with registration. They are also offering free live training classes in Micrium's office in Florida. A former client, Tau Cygnus, sent me a note that a prototype I helped develop is ready for production. The Cyborg dock makes use of an iPod and a smartphone (or tablet) to connect your audio system and to control it wirelessly. The free app works with Apple, Android, Kindle Fire and Nook devices. The iPod dock connects directly to your music system so there is no streaming or buffering of the audio. The app runs on your wireless phone or tablet to browse and control playback remotely. Visit www.cyborgdock.com for more details and see the video embedded below. There is currently a funding campaign at www.indiegogo.com/cyborgdock to help start production. In case you are wondering, I'm no longer working for Tau Cygnus and I'm not receiving any compensation for this post. If you want to expand the capabilities of the Cyborg, "...we have opened up Cyborg for developers. An API is provided so third party developers can customize Cyborg - the API is provided for both Android and Apple platforms. Of course our base station software that you helped with is under the GNU license, so that is provided as well" (President of Tau Cygnus, Greg Smolinski). For my part, I reviewed the schematics and layout, performed the board bring-up (not too much smoke), ported the bootloader, and ported the Linux OS to the system. It looks like a lot of additional work has been put into this since those early prototypes were completed. When you contribute to a project like this, it is great to see the finished product. I hope it does well and people will enjoy using it.